An Instrumentation and Control System Needs Assessment performed by AE2S showed that the water treatment facility’s Supervisory Control and Data Acquisition (SCADA) System was outdated and out of support with no upgrade path. With no support options, the facility was at risk in the event of a system failure. The servers, client workstations, and software all needed to be replaced. The Needs Assessment Report outlined several necessary improvements. Working with the City’s Information Systems Department, AE2S helped procure the new servers and software. AE2S then performed the system configuration, software programming, implementation, and start-up. The new system ran side-by-side with the old system until it was tested and commissioning procedures showed that the system was reliable. 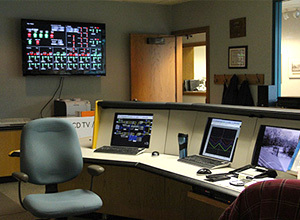 Several modifications were performed during the commissioning phase to satisfy operator requests, and program functions that weren’t available with the old system. The old system was then powered down and disassembled. With the new system going live in the spring of 2010, the water treatment facility now has a system with reliable hardware and software. The software is a widely used product that has a good upgrade path for future updates. The hardware is now managed by the City’s IS Department, which monitors the performance, plans, and budgets for future replacements. With AE2S, the City also has the technical expertise to troubleshoot problems and perform system enhancements and upgrades.